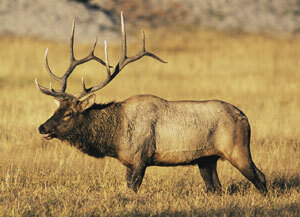 Elk are a single offspring species; twinning is rare. Selective breeding to enhance the benefits of the stock will always be in demand. Bulls produce velvet every year. An average 2-year-old will grow approximately 9 lbs. of velvet. Generally, bulls increase velvet yields every year until maturity. Mature bulls (7 to 8-years-old) may produce 30-40 lbs. of velvet. A herd with an even distribution from yearlings to mature bulls will average 15 lbs. per head. There is an expanding demand for velvet products in North America. It is a classic renewable resource. Mature bulls average 800 to 1,100 pounds, stand 5' to 5'6" at the shoulder, and are 7 to 8 years of age. They are capable of breeding at two years of age. Top velvet producing bulls have large circumference beams and mass above the third tine. The antlers' number of points is influenced by genetics and feed, as well as by maturity. Antlers fall off in March and regrow every year. When harvested in May or June, 20 to 30 pounds of Grade A velvet should be the yield from a mature bull. They dress out at approximately 60% of live weight. Mature cows average 550 to 600 pounds, stand 4' to 5' at the shoulder, and are three to four years of age. Most 18-month-old females will cycle if they weigh at least 430 lbs. They do not grow antlers. They are very good mothers. They are born in May or June and spend the first week of their lives in tall grass, usually getting up only to nurse. They are spotted when born and develop their brown coats in six months. Through natural instinct, the cow watches the calf from a short distance, drawing near when it is threatened. The rut, controlled by the day/night cycle, is from late August to late October. For best success, breeding bulls should be three years old or older. One bull can service 20 to 40 cows. A bull will gather a group of females and keep them away from other bulls. Bulls and cows go through a ritual before the actual "high mount" of mating. Artificial insemination is common, with a success rate of 50-80%. All cows will "bag up" before giving birth. The older the cow, the more "pregnant" she will appear. The cow will start to "walk the fences" prior to calving, looking for a quiet, private place to give birth. Ensure through controlled feeding that cows are not fat, as this restricts the size of the birth canal and increases the size of the calf. Although calving problems are rare, farmers can help the cow by pulling the calf, but only after waiting a lengthy period for a natural birth. The cow will immediately accept the calf and clean it, and the calf will stand to nurse.